Atlanta's development began in the early 19th century as a railroad hub. It was largely destroyed by Union forces during the Civil War, but recovered in time to be chosen the state capital shortly thereafter. In the 20th century, Atlanta was a center for the American Civil Rights Movement and served as the host city for the Centennial 1996 Summer Olympics. One of the city's nicknames, "The Phoenix City", relates to its rise after the Civil War. The phoenix appears in many of Atlanta's symbols, including its seal and flag. 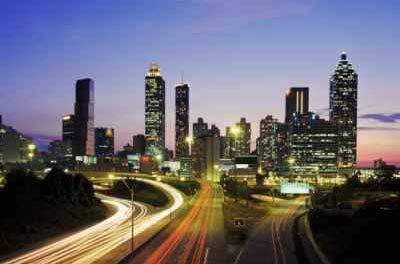 During much of the 20th century, Atlanta billed itself as "The City Too Busy to Hate". In addition, it has also been called the "New York of the South" in response to one of Georgia's own nicknames, "The Empire State of the South." Atlanta is circled by Interstate 285, which has come to delineate the interior of the city from the surrounding suburbs. This has given rise to calling residents inside the "Perimeter" (local parlance for I-285) as ITP (Inside the Perimeter) and those in the suburbs OTP (Outside the Perimeter). Despite romantic associations, Atlanta has always been more a commercial city than an ante-bellum monument. It is the major center of regional commerce, and boasts an especially strong convention and trade show business. The city is a hub for several interstate highways. I-20 runs east-west through the city, while I-75 and I-85 run roughly north-south and join near the center of the city as the Downtown Connector before splitting off again. The city of Atlanta operates the Hartsfield-Jackson Atlanta International Airport, one of two airports considered the busiest in the world, and providing air service to and from many national and international destinations. It is situated 10 miles south of downtown.